Most methods significantly reduce the nutritional value of foods, and only freezing and freeze drying are able to preserve food nearly unchanged in nutritional quality. To store your homemade, raw meat cat food, you must freeze it – unless you are in a position to use what you have prepared within a day. Small, glas jars are a great alternative for people who dislike the storage of food in plastic containers. Glass jars have the same properties as plastic containers for storing and freezing your cat food, with the exception that glass needs to be handled with greater care to prevent breakage. By the way, jars aid in protecting the food from freezer burn. 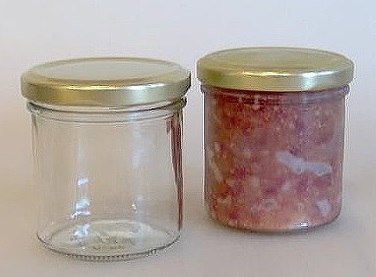 Personally, we ourselves like using wide-mouth, glass freezer jars for storing our home made, raw meat cat food. The only thing we periodically have to replace are the metal lids. Over time, they tend to get worn out. Available in a variety of brands and sizes, these containers enable you to neatly freeze your cat’s food pre-portioned. The portions easily thaw in these containers and form an attractive pudding when turned onto your cat’s dinner plate. These containers are dishwasher safe, can be sterilized in boiling water, and last for years. Ice cube trays find their greatest application during the transition period, when your cat might not eat full portions of the homemade food, yet. Freezing the homemade cat food as ice cubes enables you to thaw small quantities of food fresh every day and prevent waste. It is best to use the ice cube trays to rapidly freeze the food in the desired portion, and then to store the frozen cat food cubes loose in freezer bags for longer storage. To thaw, simply place the frozen cubes on your cat’s dinner plate and leave in the refrigerator over night. Put a small label on each container with the food type (i.e., chicken, beef, lamb, rabbit,) and the date that the container is placed in storage to know which containers contain the questionable batch. Never serve the cat food cold straight from the refrigerator. You can freeze almost any food. Some exceptions are canned food or eggs in shells. However, once the food (such as a ham) is out of the can, you may freeze it. Being able to freeze food and being pleased with the quality after defrosting are two different things. Some foods simply don’t freeze well. Examples are mayonnaise, cream sauce and lettuce. Raw meat and poultry maintain their quality longer than their cooked counterparts because moisture is lost during cooking. both food spoilage and foodborne illness. Freezing to -22 degree Celsius inactivates microbes – bacteria, yeasts and molds – present in food. Once thawed, however, these microbes can again become active, multiplying under the right conditions to levels that can lead to foodborne illness. Since they will then grow at about the same rate as microorganisms on fresh food, you must handle thawed items as you would any perishable food. Thorough cooking will destroy all parasites. Freezer burn does not make food unsafe, merely dry in spots. It appears as grayish-brown leathery spots and is caused by air reaching the surface of the food. Cut freezer-burned portions away either before or after cooking the food. Heavily freezer-burned foods may have to be discarded for quality reasons. Freeze food as fast as possible to maintain its quality. Rapid freezing prevents undesirable large ice crystals from forming throughout the product because the molecules don’t have time to take their positions in the characteristic six-sided snowflake. Slow freezing creates large, disruptive ice crystals. During thawing, they damage the cells and dissolve emulsions. This causes meat to “drip”– lose juiciness. Ideally, a food 2-inches thick should freeze completely in about 2 hours. If your home freezer has a “quick-freeze” shelf, use it. Never stack packages to be frozen. Instead, spread them out in one layer on various shelves, stacking them only after frozen solid. Never defrost foods in a garage, basement; out on the kitchen counter, outdoors or on the porch. These methods can leave your foods unsafe to eat. It’s best to plan ahead for slow, safe thawing in the refrigerator. Small items may defrost overnight; most foods require a day. For faster defrosting, place food in a leak proof plastic bag and immerse it in cold water.